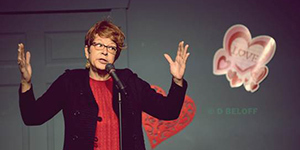 Debbie Eddings, a retired case manager for people with disabilities and a student at The Push Comedy Theater, shares the ins and outs of how wrong wrong can be and how it can still give you something right. Debbie was born and raised in Baltimore, MD, but she has lived in Norfolk for more than 30 years. She shared her story during our Feb. 15, 2015, show. The word of night was “Infatuations” and the song, “You Can’t Always Get What You Want,” by The Rolling Stones. This entry was posted in Podcast and tagged Infatuations. Bookmark the permalink.